The HTC HD2 seems to be making headlines every day now. This time the 4.3-inch monster teases us through a T-Mobile poster and we finally got to know it's full name - the Touch HD2. HTC Touch 2 will also be available through T-Mobile later this year. It's been only a few days only since we saw the HTC HD2 featured as upcoming in an O2 print catalog. 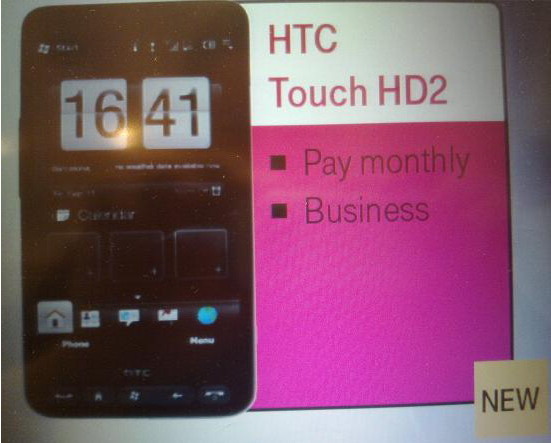 This time the blurry photo shows us the T-Mobile version (probably for Europe), which is called HTC Touch HD2. Other new details are not available. And before you close this page there is something interesting we spotted on the picture. In the O2 catalog the HD2 was promoted by the original Windows Mobile 6.5 menu, while here in the T-Mobile ad we see the HTC's TouchFLO UI. Staring carefully you can see some new features on the default home tab - some new squares (possibly contacts shortcuts) and for the first time colorful icons for the tabs icons themselves. T-Mobile will also offer the recently announced HTC Touch2, which will be powered by Windows Mobile 6.5 as well. There is no official info about pricing and availability on both smartphones, but we suppose everything will become clear quite soon when WinMo 6.5 officially launches 6 October. Does anyone know if youll be able to get this through phones 4 u any time soon? ?